For the record, I am ecstatic that President Elect Donald Trump defeated Hillary Clinton, that corrupt power-crazed chameleon who wears as many duplicitous faces as she does ill-fitting pant-suits. It was aggravating enough to see American society erode under eight grueling years of Obama's reign of tyranny. While Obama should have been protecting America from Islamic terror and black supremacists,he was too busy destroying America's medical care, ramming gay marriage upon an unwilling populace, and continuing his “rainbow” crusade to allow transsexuals into the ladies’ room. In her quest for power, the unprincipled Hillary would have pandered to every degeneracy by continuing Obama's legacy, and the American Republic would have been doomed. Fortunately, eight years of hell didn't become twelve. Reason enough to celebrate. It is good to see the downfall of corrupt arrogant people. I confess that it is more than good. It is a JOY to see deranged liberals losing their minds over the results of a lawful election. Furthermore, the liberal media was shamed for their biases, as Hillary’s litany of crimes were exposed every day like a broken sewer pipe, spewing its raw filth upon an increasingly nauseated public. As so many others, I was sick of reading about Clinton’s negligent behavior as Secretary of State which cost American lives, her culture of corruption, the criminal enterprises of the “Clinton Foundation”, and a slew of other scandals. Throw in her general vindictiveness and anti-antisemitism, and one needn’t wonder why the American public flexed it's collective might and said NO MORE. For a further look at Hillary Clinton, check out: “President Hillary Clinton: Definition of a Nightmare”. Trump’s victory offers America an opportunity to right a sinking ship, and turn back the clock on eight-years of Bolshevism. If nothing else, it means that Hillary Clinton isn’t president, and that Islam won’t triple its numbers in America and continue to grow as a fifth column. Nevertheless, it is not merely an example of addition by subtraction. With his genuine talents and patented chutzpah, Donald Trump can indeed accomplish great things for America. So I am very pleased with the results. But I am less ecstatic by the extremes of Jewish expression on both ends of the spectrum, which as I see it, have no place in a Torah perspective. 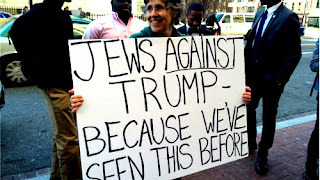 On the one hand, we have the cookie-cutter Jewish liberals, who swallowed the leftist Kool-Aid and deem Donald Trump and his associates as Jew haters, bigots, etc. In the absence of any evidence, they readily resort to the standard slurs of the left: vitriol and defamation. The Bnai Brith’s Anti-Defamation League comes to mind, with their recent witch-hunt against Breitbart's Stephen Bannon, which they have since had to backtrack on. Ironic how the ADL ignores Obama’s anti-Semitism, but saw fit to slander a man who supports Israel, exposes Islamic barbarism, and has a disproportionate number of Jews working with him. And lest we forget, Andrew Breitbart was himself a Jew. Those who were once accused of drinking blood (and still are in Arab countries), would be well to remember the sin of false accusations. No honest individual denies that there are white racists in the United states, but I would venture to say that they are fewer in number than the black Ku Klux Klan of the BLM movement, which has a wider base of support from the lib media, academia, and politicians, than any white racist ever could. The ADL should give equal attention to black supremacy. Liberalism is a world-wide pandemic, and the infected rarely recover. Look at the maniacs screeching over President Elect Donald Trump’s victory over Hillary Clinton. Bedlam unleashed in the streets. “Safe zones” on college campuses for the intellectually deprived, who want to curl up in a fetal position because Hillary didn’t win. People who equate law and order with racism. And these are the non-violent ones. The savages who resort to violence represent the darker side of this story, the veritable lynch mobs attacking people for voting Trump. The Jewish liberal will always contribute to this infection, since in the absence of Torah, one will invariably worship some version of Baal. Today’s paganism is liberal thought, so contrary to the notion of free will and the intellect. As far as the elections go, even if one doesn’t like Trump, he is better than the corrupt Hillary. One may find Trump coarse and brazen, but what of the Clintonian perversions and crimes which are so apparent? The charges of racism from the liberal federations, the Bnai Brith’s Anti-Defamation League, and the self-loathing American Jewish rags are as predictable as the morning sun. They tar innocent people while tolerating genuine anti-Semites who comprise the inner circle of Obama and of Hillary. Blood libels are the lefts tool. And when a Jew hurls a blood libel against Jew or gentile, it is an ironic perversity. The Left are supremely intolerant of dissent. In response to an alternative viewpoint, they hurl invective. We see this all the time in Israel, most recently, when Zionist Union Opposition leader, Isaac Herzog referred to “settlers” as viruses. If a politician or pundit on the right used such inflammatory language about leftists, the Shabak would pay him a night-time visit. This is the language a prominent Israeli leftist politician used to describe noble Jews who chose to live in the "liberated" areas of our biblical Homeland. The demonization and subsequent dehumanization of fellow Jews (who act as a buffer from the terrorists in our heartland) is a vulgarity that will go unpunished, since Herzog is a leader of the elitist untouchable Left. As an aside, it should be noted that the only virus in this situation is one who would use the term to tar other Jews for the crime of living in their own land. Similarly, the demonization of Donald Trump and his advisers by Jews is a grotesque mischaracterization, and yet it is to be expected, since Jewish liberals mirror their non-Jewish counterparts. All too often, liberal Jews choose misguided notions of naive, universalism to assuage guilt and self-loathing. But the repercussions of such a distorted viewpoint are exposed on a grand stage when Jewish groups make public pronouncements which have no basis in truth. As a religious Jew living in Israel, I have no expectations of any President when it comes to Israel. After all, when Israeli PM’s speak of “peace talks” and peace partners, what can one expect of any president, even a decent man? The reaction of many right-wing Jews in America and abroad is equally un-Jewish. The distorted and silly association of Trump as a messiah of sorts. For some this takes the form of misguided expectations and a delusional desire to read prophetic import into his election. This is the path of the guru and the self-styled mystic. For others, they seek out supposed proofs to show that Trump’s ascension has some cosmic implications. Both extremes are foreign to Jewish thought. The desire to demonize Trump, and the desire to deify him. From a Jewish perspective, Donald Trump is infinitely better than the nightmarish alternative. But less us not make more of it than we should. He will be much better for America. His mandate includes a promise to secure the border, fix the US economy, and deal with Muslim terror. While we certainly don’t know G-d’s ways on this matter, surely caution and discretion is the prudent path, since broad baseless predictions are not the Torah way. The ADL represents one extreme, and they are a caricature of sorts. One expects of them what one expects from Haaretz or a Herzog. An un-Jewish anti-Torah perspective which mimics western liberalism. But the religious Jew and the proud self-identifying Jew must guard himself. Donald Trump is surely no devil and we should excoriate those leftist Jews who desire to paint him as such. But we should refrain from the irrational messianic inclinations, particularly in relation to Israel’s destiny, and the desire to want to see salvation in his presidency. Unlike America, our Jewish destiny is spelled out in the shema. And if we follow the formula, neither the current occupant in the White House nor the future one have any impact on what happens in Eretz Yisroel. They have democracy. We have Divine Intervention. The left and the right: both groups are clueless, because both have a distorted framework. The former has relativism as their moral compass and so we shouldn’t wonder why the ethics of Sodom express themselves. But the religious Jew who shirks responsible analysis and resorts to populist pandering is also a tragedy. It’s all over Facebook. 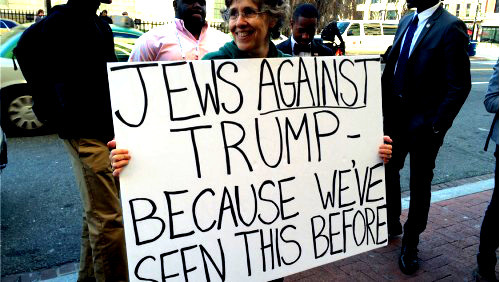 Good Jews reading into Trump and portraying him as something he is not. He is not the Messiah. From Israel’s perspective, we should expect disappointment from every president, since the worldview of even the most righteous of men, will invariably be different from the ideal image of an authentically Jewish State of Israel. I wish all the best to President Elect Donald Trump, with the hope that he follows the moral path, directs America onto a path of decency and strength, treats Israel with respect and respects our sovereignty, and thus merits the eternal promise of Abraham. These are reasonable things to hope for. But we should not assume that our lofty expectations will be met. In the meantime, there is merit in celebrating Hillary Clinton’s defeat. The occasion is certainly worthy of making a l’chaim or two with quality schnapps. In the absence of gallows for Hillary’s documented treason, which the Founding Fathers would have surely deemed appropriate for the occasion, here’s to the hope that she will soon be fitted with shackles and an ill fitting orange uniform.